Three waterfalls in this universe are considered world-class: Niagara, Victoria and Iguassu. The first two, of course, are also world-famous, But the third is unknown to many people—even those who saw the 1986 Hollywood film, “The Mission,” which starred Robert De Niro and Jeremy Irons and which was partially filmed at Iguassu. “Quite simply.” state the authors of one guidebook,”these are the world’s most dramatic waterfalls. “Straddling the Iguassu River, which at that point serves as the border between the northeast tip of Argentina and one of the southern extremes of Brazil, the falls—Foz do Iguaçu in Portuguese, Cataratas del Iguazú in Spanish and Iguassu Falls in English—are simply spectacular. Depending on whether it is the rainy season (usually December to March) or the rest of the year, the number of separate waterfalls can range from 150 to 350 and are spread out horizontally over, incredibly, about three miles. 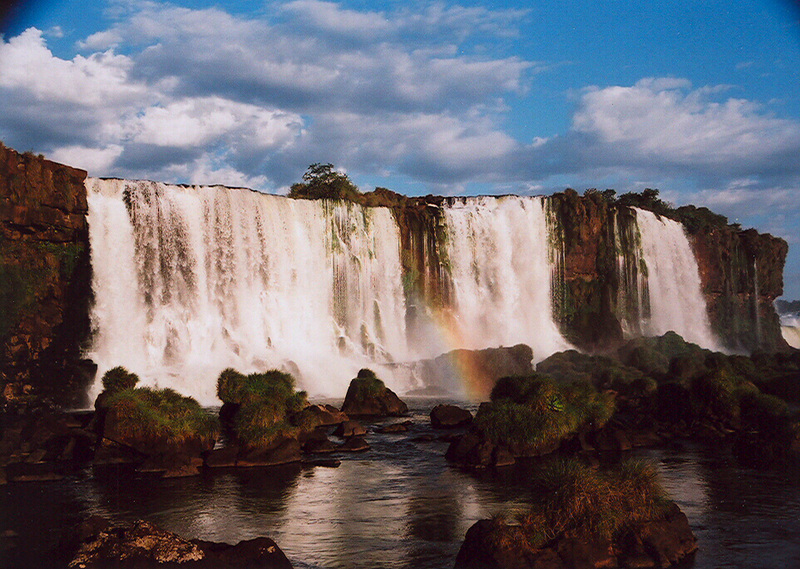 Compared with its counterparts, Iguassu is located in a substantially more beautiful area than Niagara, and, unlike Victoria, is not covered over with a mist half the year. Certainly, a visit to Iguassu Falls is a perfect side trip—two days minimum, three days preferable—for those visiting Rio de Janeiro, São Paulo and/or Buenos Aires. The falls—meaning “great water” in the Guarani Indian language—were first discovered by Europeans in 1542 by the expedition of Alvar Nunez Cabeza de Vaca of Spain. The national park, on the Brazil and Argentine sides, was created in the mid-1930s, and in the mid-1980s Iguassu was designated an UNESCO World Heritage Site.